Xtend IVR Reporting Tool implements an easy-to-use remotely accessible browser interface with full-fledged reporting features. This displays the complete call information with Caller/Called Number, Device ID, Duration etc. It is possible to access the user-friendly interface from a remote location. 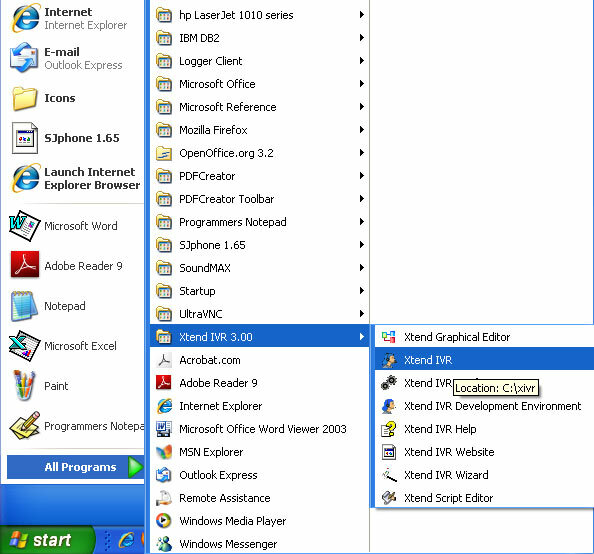 Click on Start --> All Programs --> Xtend IVR 3.0 --> Xtend IVR to enable the Xtend IVR runtime. Xtend IVR is now ready to receive the calls. As soon as an incoming call arrives on the telephone line, Xtend IVR accepts the call and this can be checked from the line status present in the display area as shown below. The enabled connection line indicates that all the steps have been correctly carried out and the Xtend IVR is properly configured with the driver. Enable/Disable Xtend IVR: Press this button to hang-up the active connecting lines and suspend currently executing script. Xtend IVR will not accept any new connection in the disabled state. 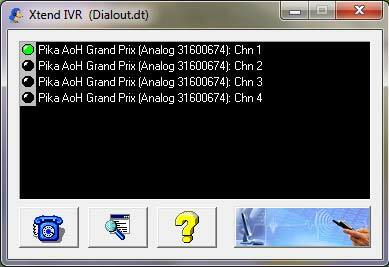 User Button: This is a user-defined button that executes the program defined by the user in the configuration (xivr.ini) file. View Log: This button goes to the Login page of browser interface. The detailed explanation about the browser interface is given below.